after setting up my OpenScope initially, it connected successfully to my home wireless lan and I could access it from the tablet or browser as expected. Then, I disconnected the scope from power and tried to run in on a power bank. The blue light wouldn' stop blinking, so no connection to Wifi anymore. I re-attached to the computer assuming the power bank had not enough power, but also there the scope wouldn't re-connect to Wifi. I checked my Fritz!Box if the channel had changed to something above channel 11, but it is a safe channel 1. Any idea what may have happened here? Are you able to manually connect the OpenScope MZ to the wifi network through WaveForms Live? When you setup the wifi connection the advanced section of the configuration page allows you to save the network settings and auto connect on boot. These are checked by default, but I would check and make sure. thanks a lot for your reply; I did try to set up Wifi using WaveForms Live again and again, using different access points of my network, even a different (guest) network my Fritz!Box provides - the OpenScope didn't connect to any Wifi anymore. I also checked all advanced parameters, all were set up correctly. Are you able to scan for networks and see the results in WaveForms Live? What version of the firmware are you using? Yes, scanning works, I can see all networks. Latest firmware available (as of Saturday) installed. Update: it is version 1.37 which is the latest according to WFL. See attached screenshots for firmware and Wifi. I tried hot spot mode of my tablet and OpenScope connected successfully to it. I changed SSID of my Fritz!Box to something without an "@", to no avail. I changed encryption of the Fritz!Box from "WPA+WPA2" to "WPA2 (CCMP)" - it connected! At least it got an IP address and red and orange LEDs blinked. But WFL on a tablet or from browser wasn't able to connect to this IP address. I then tried the 3rd encryption option "WPA (TKIP)", again to no avail, no IP address, no connection. So, my conclusion is that either firmware or even the Wifi chip itself are not capable of connecting to a Fritz!Box, at least mine (model 7390). I just wonder why it did connect at the very first try, but then refuses to connect to the very same network afterwards. Is there any way to extend compatibility on the firmware level? The OpenScope MZ supports WPA2 so I would expect both of the security settings you listed above to work. When you change the router to WPA2 (CCMP) are you able to connect to the network and power cycle the OpenScope and reconnect reliably? If so I'd be interested in staying in that mode to debug the connection issue from WFL. I'm not familiar with the Fritz!Box (other than the quick google search I just did). Is there anything unique about it? I would be surprised if OpenScope MZ was not able to connect to a router that supports 802.11g and WPA2 unless there is some other configuration issue or unique 'feature' of the router. sorry for the delay. Wasn't able to do further testing as per your suggestion but will do so on the weekend, hopefully. What is the SSID (are there any special characters like spaces, etc)? - 14 characters containing one "@"
Is there anything unique about your setup? Use WaveForms Live to setup your wifi connection. Right click on the Digilent Agent and release the device. This frees the COM port. Use a serial terminal like PuTTY to open the serial port. Set the buad rate to 1250000. You should see boot up info printed to the terminal. 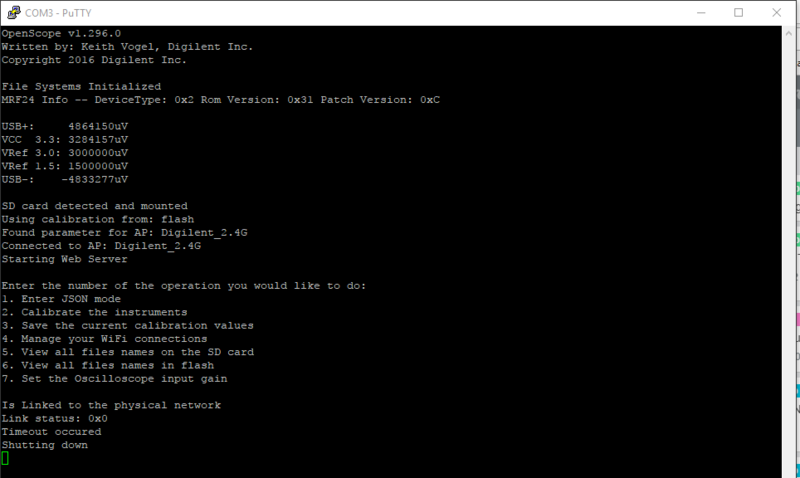 Here is what mine looks like when it connects to the 'Digilent_2.4G' network on boot. Written by: Keith Vogel, Digilent Inc. I masked my wifi ESSID for security reasons, but it is plain lower case letters. You may notice firmware version 1.4.0; after letting the device update to the latest version it claimed to be 1.296.0, I noticed that the offered firmware versions listed are sorted by plain numbers, so 296 is higher and therefore chosen by WFL as the latest; on the other hand the digilentinc.com website offers 1.4.0 as the latest. I now chose 1.4.0 and at least it already connected two times with the WIFI automatically, but in 99 out of 100 times it gives the above error. I saw you released 1.296.0 to github, so I used this one in OpenScope assuming it is the latest - still, the effect is the same as mentioned above. Have you been able to find out the root cause from the posted debug actions or do you need more information? I also cannot reconnect to wifi at home even after few restart. Did all the suggestions above and even saved on both sdcard and flash. The only way is to always configure it every start then it would connect again to wifi. When your OpenScope starts initializing the WiFi state, it is reporting a WiFiNoNetworksFound error. Even though you've asked it to save the credentials, the auto connect may happen to fail for several reasons. When a connection attempt fails, the OpenScope only knows that it's disassociated based on the response it gets back from the radio and doesn't retry. One cause of failure may be due to the signal. On a network with many connected devices the routers are increasingly busy and can't service all the traffic. If the OpenScope were on such a network, it may fail to connect to the access point. If possible, try connecting to a network with less traffic, or a stronger signal. Another possibility is that the credentials you've entered are wrong. Because the OpenScope only knows it is disassociated when it fails to connect, it cannot recognize that a connection attempt failed because of incorrect credentials and not because the network is busy. If you double (triple) check the passphrase you used, you should first delete the connection entry from the OpenScope, then proceed to entering the credentials anew. When a connection attempt fails, the OpenScope only knows that it's disassociated based on the response it gets back from the radio and doesn't retry. Why it doesn't retry few times? In Arduino ESP8266 you would try to add few time of tries and timeout, why not do the same? This PC I am using is just 1m below the router. The shelf above where the router is, is just 1m above this PC and the Openscope. That means that the Openscope is about a meter from the router. I am using Linksys AC1900 (Max Stream EA7500) Dual Band Wireless Router 2.4Ghz and 5Ghz with only 5 devices connected. If you double (triple) check the passphrase you used, you should first delete the connection entry from the OpenScope, then proceed to entering the credentials anew. I don't need to do that. When I go to configuration menu, I just click the "saved network", it would connect right away. That means my credentials are all OK. It could be a problem in the field when using it without a USB connection to connect it to wifi. That means that I need to bring a laptop to configure it while on USB just to connect it to wifi. But when I unplug it expecting that it would connect to wifi, it would not. Then I would connect it again to a laptop to configure it to connect on wifi. Instead of just bringing a tablet, I would need to bring an extra laptop.